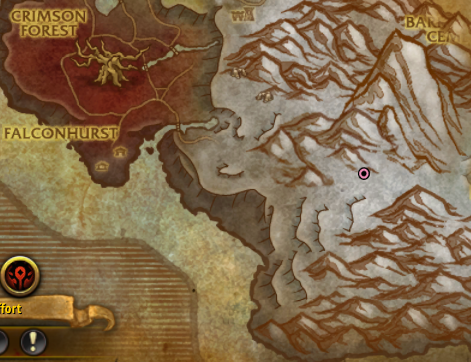 Currently on BETA the WQ for this WB shows on Stormheim map instead of its true location. You can find him in Drustvar exactly on <49.27;74.17> or take a look here and just go where the paladin dot on the map is. You can complete the WQ normally, it becomes active as soon as you get there. Active only with this Un encuentro escalofriante world quest. He is located in Drustvar subzone Iceveil Glacier . South part of the map in the mountains. You can get there from west or east road. East road starts near the Gol Koval area. West road is near the Snowmelt Foothills area, you can see a road end in the snows. Not spawning for any of the groups I've joined after reset. In Epic Elite World Quest Un encuentro escalofriante You need to kill Ensamblaje de granizo. He is located between mountains 49 74. You can get to him from Arom's Stand is ease way but long :P. Get in group to kill him. you should not have a problem with it. He is a part of Eres un monstruo. According to the dungeon journal you're supposed to hide behind a Permafrost Spike when he casts Freezing Tempest. This seems bugged right now. Both times I hid behind, and still got frozen. Saw others doing the same, and also getting frozen. Meanwhile quite a few players just stood still, and didn't get frozen at all. Never really liked the concept of flying mounts... Excpet when I'm looking for the path to this 27 Azerite-Shplintter dropping punch bag. The path starts just to the left of that HUGE ice cave entrance. Este PNJ se puede encontrar en Drustvar (2). Overview – The Hailstone Construct uses a variety of attacks to chill its enemies, from inflicting Frost damage in its melee swings to massive AOE attacks that both slow and freeze anyone hit. [Ice-rimed Fists] causes all of Hailstone Construct's attacks to cause Frost damage instead of Physical, so magical defenses will be handy. Use cover created by [Permafrost Spike] to avoid being frozen by [Freezing Tempest]. Move to avoid [Glacial Breath]. Tanks may required additional healing since [Ice-rimed Fists] causes all of Hailstone Construct's attacks to cause Frost damage instead of Physical. Puños escarchados – Freezes the caster's hands, causing melee attacks to inflict Frost damage. Púa de escarcha permanente – Causes the frozen ground below random targets to rupture, inflicting 10 Frost damage and knocking them back. Additionally, a Permafrost Spike is left behind. Aliento glacial – Releases a breath of frozen air, inflicting 10 Frost damage and slowing all enemies in front of the caster. While casting Glacial Breath, the caster rotates in a random direction. Tempestad congelante – Lets out a massive blast of icicles in all directions, inflicting 20 Frost damage to all enemies in line of sight and freezing them.